Rockingham has been enjoying increased exposure on the world stage after catching the eye of Chinese TV producers. Mega-popular Chinese reality TV show Viva La Romance spent a few days filming in Rockingham in January, shining the spotlight on Rockingham, where the coast comes to life. Rockingham took advantage of the interest created from the visit to maximise its exposure as a tourist destination. A week of press and social media culminated in a live broadcast from the foreshore by Hit 92.9, followed by a two-week partnership with its breakfast show. 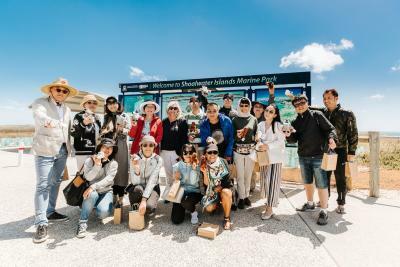 A few weeks later Rockingham hosted a group of 14 of China’s most influential media producers who wanted to come and scout the breathtaking coastline for potential filming locations. Rockingham also featured at the annual National Association of Travel Agents (NATAS) Travel Fair in Singapore in February. The fair is Singapore’s largest travel fair and provided the city with the opportunity to market itself to thousands of potential holidaymakers. City of Rockingham Mayor Barry Sammels said the increased focus had provided a fantastic opportunity to highlight the breathtaking coastline, stunning wildlife and exciting eco adventures Rockingham is known for. “The opportunity to swim with dolphins, visit Little Penguins, swim in crystal clear waters and photograph a spectacular coastline, all only a short drive from Perth, is a combination that is proving very tempting to tourists,” Mayor Sammels said.